that has held back the cause. We are doing all we can to push – Chinese New Year is a crazy time – the factories are shut down for 3 to 4 weeks and as you can imagine the stress prior to and the performance after. Hopefully in the next couple of weeks our http://titusradio.com/ website will undergo a much needed update. So much to do – but we are making good headway. Thank you, Mike! I’ve had a number of readers asking about progress on the Titus II, so I appreciate the update! This entry was posted in DRM, New Products, News, Radios, Shortwave Radio and tagged Digital Radio Mondiale, DRM, PantronX Titus II on January 15, 2017 by Thomas. Another vaporware among 53 other DRM receivers since 2002 ? PantronX unveiled the Titus II at the B16 HFCC/ASBU conference in Miami, Florida, 22 August 2016. Recently, PantronX claimed “Chinese New Year is a crazy time – the factories are shut down for 3 to 4 weeks”. Chinese New Year started Saturday, January 28th, 2017 and official Holiday last 7 days; most people returned to work Friday, February 3, 2017. So, 27 work weeks after its first presentation, are there any pre-production sample ? Lots of speculation. Absolutely nothing of substance. -what does it mean “HIGH SENSITIVITY” on its page http://titusradio.com/rf-features/ ? Wish it had an analog “S” meter icon on the dashboard though, hihi. Will be interesting to see the user reviews when this model hits the consumer market stream. I have pre-ordered a time ago and I am very anxious they can release a Tablet with various features and of good quality below 100 USD. I thing that intrigues me is that I thought it would be made in a Central America country. But as i can see now it will be made in China what makes possible this low price. -Keeping RFI noise out of the system. I’d guess the tablet’s electronics could easily “contaminate” the SDR dongle or circuit with interference. -Good, high S/N sensitivity for the DRM reception. Even with a full size external antenna and software like the Elad FSM-SW2, DRM needs a high signal to noise ratio for reliable demodulation. This thing is looking more and more like vaporware. There is no way they can manufacture and sell this unit under US$100 and make any money unless their quantity is 50K+, which is highly unlikely. Let the potential buyer beware! Yes, I was about to leave a similar comment. PantronX hasn’t asked for any funds up-front. We’re out nothing if this doesn’t come to fruition. In reality you are correct. You may notice I put “pre-ordered” in quotes. I used the terminology directly from their web site. I added the quotes to bring attention to the fact that it really wasn’t a pre-order but a way to express interest. 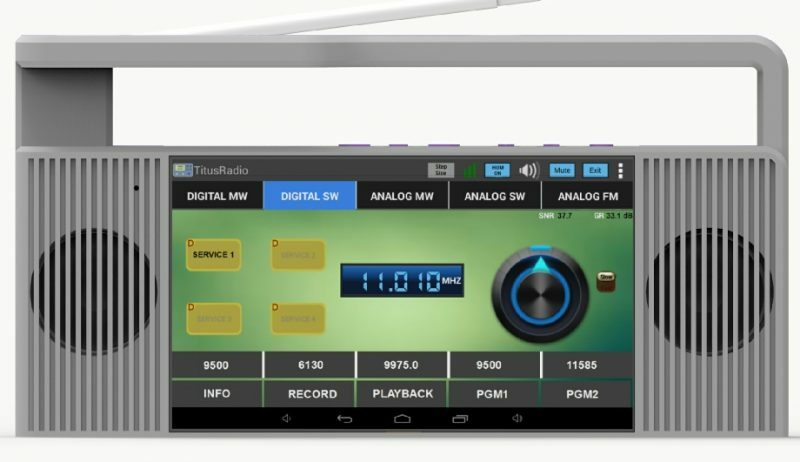 It’s basically an Android tablet and an SDR, I believe. Amazon sell a decent Android tablet for $50 and some SDR dongles go for about $20 all retail. So it seems to me that it could be doable at around the $100 mark. It would be worth it if the software was well integrated and easy to use. Yeah, that’s the thing. You can get Android tablets with the same specs for US$30 or less and USB SDR sticks for < US$10, in small-ish quantities (<1000) from China. And that's for complete units in retail packaging – sub-assemblies & parts are available cheaper even in small volumes. Tooling & production for the case etc. will add to that – and for small runs might even be the largest single cost in the device – but, as a first approximation, it shouldn't be too hard to hit a production cost of US$50-US$70. Guessing here, but it wouldn't be a big surprise if TWR subsidised hardware development & assisted with lining up suppliers & manufacturers. Do you also want to add some bandpass filters to it or just keep it usable only in middle-of-nowhere areas?